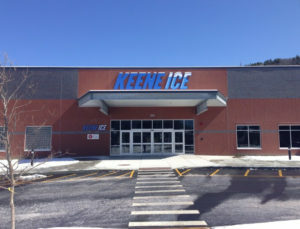 Keene Ice Arena located in Keene, New Hampshire, was originally designed with a standard refrigeration structure and geothermal HVAC system, similar to those in bordering cities that had been renovated over recent years. 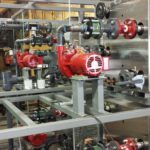 The progressive board and community were intent on installing an extremely efficient system with a minimal carbon footprint. 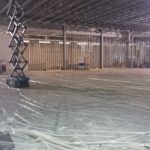 Preferred Mechanical Services‘ initial design used Emerald Environmental Technologies ice3 Cube System to supply reclaimed heat in all locker rooms and back of house spaces, as well as geothermal heat pumps for the front areas and meeting rooms requiring both heat and air conditioning. 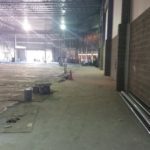 The locker rooms were installed with radiant floors and ventilation systems, these being sourced from the ice3 Cube’s 105-degree Fahrenheit loop. Zamboni water was also preheated by reclaimed heat. 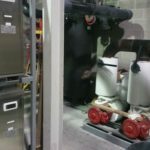 An AC coil was installed in the Arid Ice Dehumidifier that would maintain indoor temperatures at 45 degrees Fahrenheit. 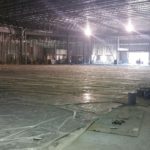 As the customer wanted to conserve all natural resources, the design allowed for indoor snowmelt of ice shavings that reclaimed its water for use in cooling ice3 Cube heat. 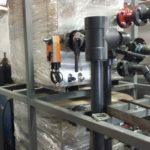 This water source also permitted the Evaporative Fluid Cooler to reject excess waste heat as needed. Upon reviewing the design, it was clear that there would be excess waste heat because the geothermal heat pumps at the front of house did not make use of the reclaimed heat. It was more efficient to delete the initial geothermal design, utilize additional radiant floor reclaimed heat and employ a coil in the existing rooftop to serve the public meeting room. The improved design supported Emerald Environmental Technologies ice3 Cube System heat with standard rooftops sourced from propane, and operated compressors for AC when needed. 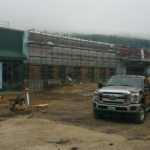 The entire front of house in the existing building required the concrete floors to be removed and reinstalled, as well as incorporating an additional structure for the proposed rooftop equipment. The supplementary costs were then compared against the costs carried for the initial geothermal system. Also proposed was the option of adding snowmelt at the front entry walkway. 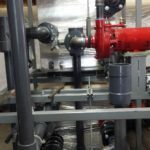 Due to the presence of radiant supply piping in that specific area, the addition of walkway snowmelt was at minimal cost to the client. A third-party engineering group to test for energy efficiency and energy consumption reviewed the two design options. 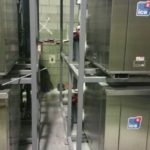 It was agreed that the assumptions and calculations of Preferred Mechanical Services were correct, and the reclamation of waste heat from the ice3 Cube plant was more efficient than installing geothermal heat pumps. The initial decision was reversed and the Reclamation heat design was installed. 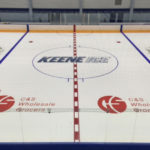 The Keene Ice Arena installation is a perfect example of a combined HVAC and refrigeration design. 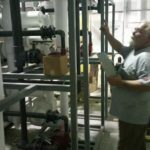 Here, we proved to the customer that reclaimed heat would be more efficient than geothermal because of the rink’s program use. Emerald Environmental Technologies produced energy analysis when working with third party engineer that was completed in order to operate the system efficiently and economically—with little to no fossil fuel! In the end, the ice3 Cube System produced so efficiently, there was no reason to install the geothermal system. After the design was implemented, savings offset the costs for construction, by not installing the geothermal systems. 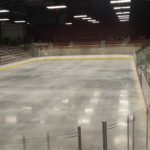 Each winter since installation, Keene Ice enjoys the use of reclaimed heat for their entire facility including locker room ventilation and radiant heat throughout allowing the full use of the reclaimed heat. 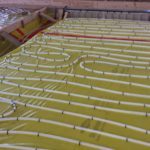 During unoccupied periods, the Direct Digital Control system shuts down ventilation and allows systems to store heat energy within the concrete radiant heat floors when the ice3 Cubes are operational for refrigeration but little to no heat demand is required. By balancing and regulating the waste heat, the system allows the customer to arrive each morning and enter a warm facility. The operator certified the design’s reclaimed waste optimization, noting that evaporative fluid cooler operations to reject waste heat rarely occur. A new ice3 Cube decoupler is now employed, where smaller cold floor pumps at 15 HP were previously used to recirculate the cold floor and operate slowly when occupancy changes, these smaller pumps are still able to achieve a three-minute fluid change in the cold floor for high loads, but they do not have the pressure drop of the Cube’s heat exchangers. Additionally, each ice3 Cube has a small, 2 HP cold pump that circulates to and from the Cube decoupler, but is only in operation when the Cubes are staged on. This pumping horsepower is eliminated when a Cube is not running. A 1,000-gallon warm storage tank is also installed, to reserve energy during periods of Cube operation and low heat demand. Approaching the seasons of spring and summer, the locker room ventilation draws cold fluid from the Cubes to remove moisture from the air, allowing it to be reheated and then supplied to the space. Locker rooms are kept odorless and comfortable. 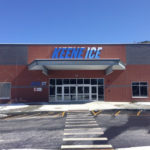 Overall, the Keene Ice facility is exactly on-target for their energy consumption goal and has become the premier ice arena in the southwest New Hampshire area.